The World Factbook, produced annually by the CIA, has become the ultimate authoritative source of information on all the nations of the world. It provides current data for more than 250 countries and territories, fromAfghanistan to Zimbabwe. 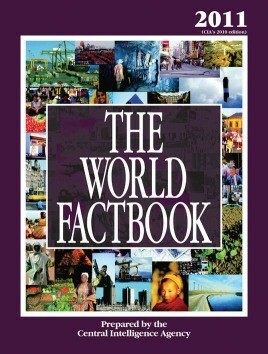 Unfortunately, due to sales rights restrictions, we cannot offer The World Factbook for sale in your country. The World Factbook, produced annually by the CIA, has become the ultimate authoritative source of information on all the nations of the world. It provides current data for more than 250 countries and territories, fromAfghanistan to Zimbabwe. Potomac Books publishes a commercial version of The World Factbook in order to extend the limited audience reached by the CIA's own publication. This current Potomac Books edition is identified by the year 2011, following the pattern used in our other annual publications.The CIA completes its volume late each year, and Potomac Books republishes it the following year. Topics addressed include the political climate, natural resources, environment, population, ethnic groups,GDP, agriculture, industries, defense expenditures, literacy rate, religion, legal system, and much more. Key data are grouped under the headings of geography, people, government, economy, communications, transportation, military, and transnational issues. The World Factbook also contains maps of each country and of key territories. In addition, readers will find handy appendixes on international organizations and groups, international environmental agreements, and a cross-referenced list of geographic names. The World Factbook provides the indispensable reference for curious individuals concerned about a rapidly changing world.